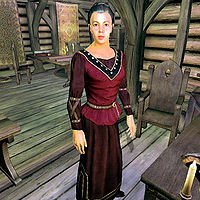 Skjorta is a Nord merchant at Nord Winds in Bruma where she sells clothes, while her husband Olfand sells weapons and armor. She examplifies the "barbaric" Nords, as she often gets drunk and runs around town. She wears a burgundy linen shirt with burgundy linens and doeskin shoes. She also carries the key to her shop and a medium-sized amount of gold. She wakes up at 8am and will open up her shop for a long 12 hours. After that, she will head over to Olav's Tap and Tack for a 4 hour dinner. She may run around, drunk, from either 10pm to 12am or 12am to 2am. Outside of these actions, she will wander her shop. During Defense of Bruma, she will shortly provide her services between the point where the Countess ordered her men to stop opening Oblivion Gates and when Martin leaves the city. When you're in her shop, she may greet you with: "Skjorta. Nord Winds. We've got clothes and armor. And I've got a headache, so keep your voice down, please." Upon asking her about Bruma, she will express her fondness of alcohol: "We drink because we're happy. We're Nords. It's just the thick tongue and fat head the day after that makes me unhappy." "What do you think about all of Skjorta's antics?" or "Can you believe how Skjorta acts?" "I don't know why the guards haven't taken care of her yet." or "She's a disgrace to our whole city. Poor Olfand." "She's ridiculous. I suppose some may find it amusing, but not me." or "It's awful. I feel terrible for her husband. He must be so ashamed." "Skjorta is a nuisance. She was running around town, drunk and naked again." "Someone needs to get Skjorta under control. You'd think Olfand would be the one to do it." "Olfand really has his hands full with Skjorta. I don't know how he has time for business." "Poor Olfand. I don't know how he manages to live with Skjorta." She should be able to sell the unique Councilor's Hood, but someone mistakenly gave ownership of the chest it's contained in to S'Krivva (who is alphabetically next in the NPC list), a Thieves Guild operative in Bravil, instead. Since S'Krivva is not a merchant, even bringing her to Bruma will not work, so it seems, unfortunately, that this item is completely unavailable.